I have always thought London is a visually-interesting city. I hesitate to say pretty, because there are parts of it that can’t be called pretty by any stretch of the word, but it’s certainly a city with a unique look to it. A lot of cities are like that: recognizable from their skyline or their architecture: Paris is perhaps the most famous, though New York’s skyline is famous as well, and so, of course, is London’s. In a way, one can almost determine the personality of a city from its skyline alone, in the same way one can almost determine a person’s temperament from his or her face. It’s not ever an accurate assessment, of course, whether one is judging a city based on its skyline or a person based on his or her features, but it can give some indication of what lies beneath the surface. One of the writers I am currently reading who attempts to explore London’s other side – but with a supernatural twist – is Ben Aaronovitch. His series, called either Peter Grant after its main protagonist, or Rivers of London after the title of the first book and/or a set of key characters whose presence is felt across all the books to varying degrees, takes London – both past and present – and uses it as both character and backdrop for an urban fantasy detective story. Broken Homes is the fourth book in the series, and, in my opinion, is probably the best since the first book came out. While books two and three (Moon Over Soho and Whispers Under Ground, respectively) seemed a little lost in terms of where they were going, Broken Homes finally takes one of the core plot threads that ran in both books and gives them a proper, solid direction – as well as raising even more questions about just what in the world is really going on in this not-so-secretly-magical London. Broken Homes takes place a few months after the events of Whispers Under Ground. Peter Grant, his associate Lesley May, and their boss, Thomas Nightingale, are still tracking down the Faceless Man and his associates, the members of the club called the Little Crocodiles, who were first introduced in Moon Over Soho and whom they have been actively pursuing since Whispers Under Ground. In Broken Homes, however, they get the first solid, recognizable link they have to the Faceless Man since the events of Moon Over Soho: a man has been found gruesomely murdered via magic, and it has the Faceless Man’s marks all over it. Then a suspicious suicide occurs in the Tube, and it, too, has the Faceless Man’s marks all over it. And then there is the case of the Skygarden, a housing estate in Elephant and Castle that developers are itching to tear down – but which might be connected to the first two cases. As always, Peter Grant’s life is never easy, but in his London, nothing ever is. One of the first things reviewers have thus far complained about is the pacing for this novel, citing that the first half is something of a drag. I suppose in this they are referring to the “detour” that Aaronovitch takes away from the main case/s to focus instead on the Rivers – that large and very odd family of genii locorum who were some of the most important characters in the first novel, and who drifted in and out in the second and the third. I, for my part, do not see anything wrong with this detour – in fact, I welcomed it. When they were first introduced in Rivers of London, the Rivers were pretty much some of the best and most iconic characters in that novel, the first indication that this is not the London the reader knows. Their fleeting presence in Moon Over Soho and Whispers Under Ground made me miss them somewhat, so to see them back in full force in Broken Homes is something I greatly appreciate. Even better, the events of the novel promise even greater involvement further down the line, especially after the introduction of new characters such as Oberon and Nicky (the river Neckinger). Beverley also returns, and the question of her relationship with Peter (as it was established in Rivers of London) is brought back into question. All of this comes to a head when the two chief genii locorum of the Thames, Father Thames and Mother Thames, come together with all their sons and daughters (and their respective beaux, hangers-on, and so forth) for a party in London. Some have claimed that this entire scene – indeed, the whole bit about the Rivers – is unnecessary, but I think that it’s an indication of a deeper plot point that, like the Rivers, was brought up in the first book, glossed over in the second and third, and which is brought back again in full force in Broken Homes: the return of magic to the world. In the first book Nightingale says he has always assumed that he was the last of his kind, the last of the British wizards, but Peter – and later in books two and three, the Faceless Man and his cohorts – prove him wrong. And nothing more strongly proves this return of magic to the world than the court the Rivers hold and which the Folly winds up policing. At the very least, it’s setup for later events – not in the same novel necessarily (though the court does introduce Oberon and Nicky, who are important in the second half of the book), but further down the line in the next novels. At least, that’s what I hope is going to happen. Another interesting aspect of this novel is how it expands the magical world, introducing the idea that it’s not just London that’s magical. Just as the fourth book in J.K. Rowling’s Harry Potter series introduced magical schools from outside of the UK, non-British magical practitioners are brought up in Broken Homes. Though this has already been done in previous novels (in Whispers Under Ground the reader is offered some insight into Nightingale’s past, including that disastrous World War II mission where all British wizards, save for himself, were killed – or so he thought), it is only in Broken Homes that Aaronovitch introduces a magical practitioner who is not British, in the form of a former Russian nochnye koldunyi, or Night Witch (not to be confused with the heroic, daredevil female Russian fighter plane pilots the terrified German soldiers called Nachthexen), who fought in the same battlefields Nightingale did during the Second World War. While her role in Broken Homes is secondary villain, later events prove that she might be a potential ally in further novels down the line. This will be interesting, since it will allow the reader a glimpse of magic as it is worked by non-British practitioners. One of the things I love most about this book – and of the series as a whole – are the characters. Peter Grant is a comfortable and fun constant, especially because of his humor, and Peter is in top sarcastic, snarky best in this novel. He peppers his humor with current pop culture references, thus grounding the novel in a proper time and place: there is a reference to Game of Thrones in the novel that will have the reader chuckling if they know what the show and/or the novels the show is based on are about, and there are Lord of the Rings and Doctor Who references buried in the novel that had me laughing aloud to myself (and startled my dog from her nap when I did so). There are also Harry Potter references that had me quietly snickering to myself, but those are not as funny anymore because Rowling’s work is constantly referenced throughout the series at various points. This is not to say those callbacks aren’t funny, because they are: it’s just that they have gotten a bit ubiquitous and so do not come out of left-field for me anymore. As for the plot, it is a good ride, more so than it was in the last two books, for reasons I have already mentioned. There is also a very, very large twist at the end of the novel, of which I shall say nothing, except that it may knock the reader for a loop – even if there is already a lot in the novel to indicate that it was probably going to happen. Either way, the main plot of the novel, and the twist at its end, all begin to point to a new direction that the rest of the series may take – one which is both rather terrifying, all things considered, and very exciting for the same reasons. 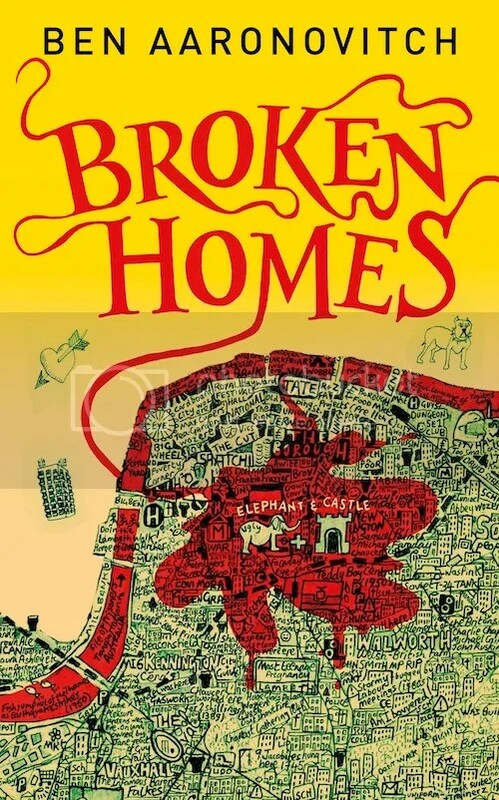 Overall, Broken Homes is a return to the thrill and excitement of the first book, Rivers of London. The plot this go-round is more concrete than it was for the last two novels despite the “detour” of the first half of the novel, which I feel ought to be viewed as buildup for further events to come in upcoming novels (especially considering the gravity of the event). New characters are fascinating, and old characters are as enjoyable as ever – not least Peter Grant, whose snark and humor I still very much appreciate. However, there is a massive twist at the end that will hit the reader like a ton of bricks if he or she did not see it coming, and it promises some very exciting – and scary – things for the books to come, which, I think, can only be a good thing for readers who are excited to see what happens next in Aaronovitch’s strange, magical version of London. Once again, I am on tenterhooks for the next novel, which I think cannot come out soon enough. Great review! I agree; this one was much more on track, and that twist at the end HURT. I can’t wait to see where this series goes! I really wasn’t expecting that twist; it came at me like a freight train out of left field. And yes, it very much hurt. Immensely. I also like how it appears Aaronovitch is getting back on track with a proper story arc now; makes me eager to find out what’s going to happen further down the line :).